With so many different types of bouquets- it hard to decide which would be best. Just make sure you take into account your overall theme for your wedding. Ballerina: A round bouquet composed of masses of tulle or net and few flowers. This type of bouquet was popular in the early 1940s when flowers were scarce due to World War II. Basket: Flowers arranged and carried in a shallow basket and often used in a garden or garden-like wedding setting. Cascade: A waterfall-like “spill” of blooms and greenery that’s anchored in a hand-held base. Looks like a miniature floral train. This bouquet can be designed very dense with flowers and foliage or can be more loosely arranged for an “airy” or “wispy” look. Classic Hand-Tied Bouquet: Generally round in shape, hand tied styles are also referred to as clutch bouquets. 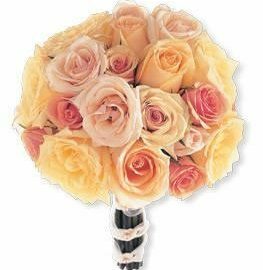 A dense bunch of blooms either anchored in a bouquet holder, wired, or hand-tied. Crescent: A dramatic bouquet of arching flowers and foliage that extends from the center of the bouquet and can be designed to project a traditional or contemporary look. Fan: A small bouquet or cluster of flowers attached to an elaborate fan. This style of bouquet is reminiscent of the Victorian Era, and is popular for vintage style, Southern style, and Asian-inspired weddings. Freeform/Contemporary: As the name implies, this style bouquet often has flowers or greenery coming out at various angles with no specific, recognizable shape; most often designed with tropical flowers and foliage that have unique shapes. Heart: A romantic, alternative shape bouquet, featuring two, full, arched shapes at the top while tapering down to a point at the bottom of the bouquet. Oval: This bouquet is a hybrid of both a cascade and a round. It is elongated in shape, but features rounded shapes on both the top and bottom. Generally the bottom is narrower than the top, but the overall shape resembles an oval. Presentation bouquet: Think of the roses carried by Miss America along her arm. This can be as simple or as elaborate as you wish but should not be longer than what can fit comfortably, with some spillover, along the length of your lower arm. Single Stem: Single stem designs generally feature a unique design element, such as an intricately wrapped stem (for a long-stemmed flower), elaborate bow, streamers, or a decorative lace bloom collar to give the design more interest and appeal. Wreath or Hoop: This “bouquet” is a large ring decorated or intertwined with foliage and flowers- generally thought of as a symbol of eternity with no beginning or end.